​Borussia Dortmund allowed a three goal lead to slip as they drew 3-3 with Hoffenheim, denying the Bundesliga leaders a chance to go 10 points clear at the top. Jadon Sancho, Mario Gӧtze and Raphael Guerrerio had Die Schwarzgelben cruising at 3-0 before a heroic comeback from Julian Nagelsmann’s Hoffenheim stole a point for his side. A brace from Ishak Belfodil either side of Pavel Kaderabek’s header sent the travelling support home relieved with a well earned point. ​​​Dortmund manager Lucien Favre missed the game due to illness and was forced to watch from afar as his team dropped two points. 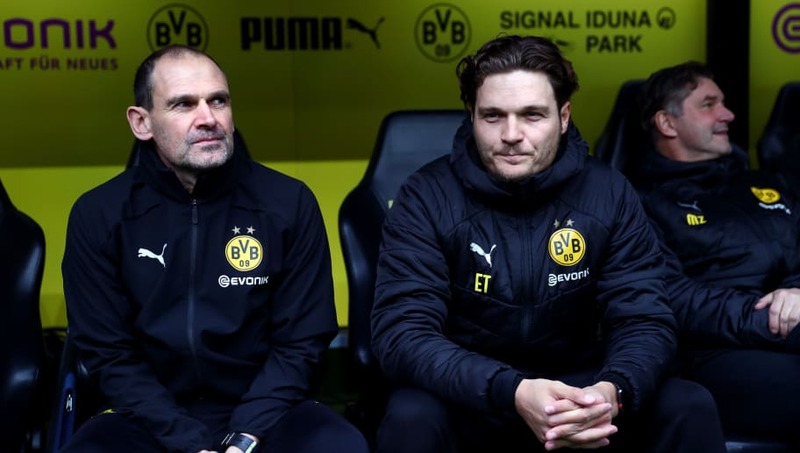 Favre’s assistants Michael Stefes and Edin Terzic took charge on the sidelines at Signal Iduna Park on Saturday Afternoon. Youngster Sancho terrorised the Hoffenheim defence in the first half, with a goal and an assist he pulled out a man of the match performance. The Englishman also had the ball in the back of the net early in the first half though VAR ruled the goal out as Gӧtze was in an offside position. Stefes confirmed that he and Terzic were in contact with Favre throughout the game and the Dortmund boss was understandably disappointed by the manner of the result. ​“We had contact with Lucien Favre during the match. I spoke with him on the telephone briefly after the game was over, and he's just as disappointed as we are. It's very annoying of course but we still got a point from it. The team will put this game behind them," Stefes added. Gӧtze, who scored Dortmund’s second goal, revealed that despite a good individual performance he was disappointed by the end result. ​Gӧtze said: "Even if the manager is absent, we have to deliver out on the pitch. We need to get the result over the line with confidence. Things went well for me today, but I would have loved to win." ​​​Dortmund will hope Favre will be back and able to take full control of the team in their next ​Bundesliga match when they visit Nürnberg next Monday.